The US geographical (rather than operational) codename for Truk atoll in the Caroline islands group of the central Pacific between 1941 and 1945 was originally ‘Anaconda’ and then ‘Panhandle’. A group of hilly islands, the tips of drowned mountain peaks, surrounded by a large barrier reef with five passes, Truk is a large atoll lying to the east of the centre of the Caroline islands group with the Palau islands group 1,035 miles (1665 km) to the west, Guam in the Mariana islands group 555 miles (895 km) to the north-west, Kwajalein atoll in the Marshall islands group 925 miles (1490 km) to the east, and Rabaul on New Britain islands in the Bismarck archipelago 690 miles (1110 km) to the south. The USA’s main base in the Pacific Ocean, Pearl Harbor in the Hawaiian islands group, is 3,260 miles (5245 km) to the northeast. Truk atoll measures about 40 miles (54 km) on both its north/south and east/west axes, and is approximately triangular in shape. It is a complex atoll with 98 land masses in the form of 11 major islands, 46 smaller islands and islets in the lagoon, and 41 smaller islands and islets on the fringing reef, which has a circumference of 140 miles (225 km) and encloses a lagoon measuring 31 by 49 miles (50 by 79 km) with an area of 820 sq miles (2130 km²). Truk atoll’s land area is 35.93 sq miles (93.07 km²), and it highest elevation is 1,453 ft (443 m). Most of the rim islands and islets on the atoll’s eastern side are long and narrow, while smaller islets are scattered densely along its north-western side. The south-western side’s islets are more widely spaced. There are five main entrance passages into the lagoon: North (‘Wayward’), North-East (‘Alphonse’), Otta (‘Monsoon’) in the south-east, and South or Aulap (‘Forceps’) and Piaanu (‘Glowworm’) in the west. Just a few miles off the south-eastern corner of the atoll at Otta Passage is the elongated oval Kuop or Kunyuna atoll, measuring 18 by 5 miles (29 by 8 km), while the even smaller and circular Losap atoll is about 60 miles (96 km) to the south-east. From west to east, the main islands within the lagoon are Tol (‘Portfolio’), Udot (‘Paleface’), Param (‘Codling’), Fefan (‘Calefaction’), Moen (‘Anathema’), Dublon (‘Adherent’) and Uman (‘Centimeter’). Tol is the largest of these, and islets located around it bear the names of days of the week. The islands inside the lagoon are covered with comparatively high hills, covered by palms and brush, and limned by narrow fringing reefs. The two most important of the islands are in the lagoon’s western portion. The larger of the two, and the second largest in the lagoon, is Moen which in World War II had two airfields (Moen 1 and 2 at its northern and southern corners respectively) and a seaplane base. To the south of Moen is Dublon, the fourth largest island in the lagoon (after Fefan), which included the principal town and the Japanese administrative headquarters of the Central Caroline District. It was also the port of entry and possessed a seaplane base. Immediately off the south central shore of Dublon is the 83-acre (33.6-hectare) islet of Eten (‘Bannister’), whose shore had been shaped into a rectangle and included an airfield, thereby giving the islet an appearance not dissimilar to that of an aircraft carrier. Near the centre of the lagoon, Param also had an airfield. A small island on the eastern side of Otta Passage at the atoll’s south-eastern corner Mesegon island also sported a small airfield. Members of the local population were not permitted on these islands, and those living on them had been moved to other islands. Before the start of the Pacific War, there were almost 3,000 Japanese civilians and persons of the 18,000 native population living on the atoll. Japanese traders had arrived on Truk in 1891, when the islands were a Spanish possession. In 1898 Spain sold most of its Pacific island possessions to Germany, which lost them to Japan early in World War I. In 1920 Japan received a League of Nations mandate over the islands, and in 1939 began the large-scale development of Truk as its major naval base in the the Mandated Territory. It was fortified with coast-defence artillery covering the five passes, which were also blocked by command-detonated mines, while other guns were positioned to prevent landings on the outer islands. Most of the warplanes, troops, supplies and matériel for the Solomon islands, Bismarck islands, New Guinea and other early Japanese campaigns of aggression stages through Truk atoll, as later did those required to defend the Japanese empire’s shrinking perimeter. In February 1942 the headquarters of the 4th Fleet arrived on Truk from the Palau islands group and took up residence on Dublon island, which had about 1,200 buildings and facilities, including a 2,500-ton floating dry dock, to make temporary repairs on many types of warship. In July 1942 the Combined Fleet (elements of the 1st Fleet, 2nd Fleet, 3rd Fleet and 6th Fleet, of which the last was responsible for submarine operations) arrived on Truk. At the height of the atoll’s life as a Japanese base area, as many as 1,000 ships were on occasion to be found in the lagoon. While Truk was undoubtedly a superior anchorage and also well defended, its repair facilities were limited. Truk was defended not only by major naval and air forces, but also by significant ground forces. These included the 52nd Division (69th Regiment and 150th Regiment but not the 107th Regiment, which had been detached to Ponape), most of the 51st Independent Mixed Brigade, and army service and support troops, as well as the navy’s 4th Base Force, 41st Guard Force, 101st Sasebo Special Naval Landing Force, and major air base service units as well as construction units with 5,200 labourers. Lieutenant General Shunsaburo Mugikura commanded both the 52nd Division and the 31st Army as well as the Truk District Group. Vice Admiral Chuichi Hara commanded the naval forces of the 4th Fleet remaining in the islands. The Japanese construction of fortifications did not begin until 1940 and then proceeded at a comparatively leisurely pace until January 1944. The garrison had reached a strength of 7,500 army and about 4,000 naval personnel by February 1944, and as noted above coast-defence artillery was sited to cover all five passes, which were also protected by controlled mines. However, there were only 40 anti-aircraft guns with no fire-control radar. In May 1945 there were an estimated 13,600 army troops and 10,600 naval personnel. Several of the atolls around Truk were also defended, and these included Woleai (5,500 men of Major General Katsumi Kitamura’s 50th Independent Mixed Brigade and Commander Yoshinobu Miyata’s 44th Guard Force); Puluwat (3,500 men of the 11th Independent Mixed Brigade and a naval detachment); Nomoi (2,400 men of the 51st Independent Mixed Brigade and a naval detachment); Ponape (8,000 men of Major General Masao Watanabe’s 52nd Independent Mixed Brigade, 107th Regiment and Captain Jun Naito’s 42nd Guard Force; and Kapingamarang (400 men of army and navy detachments). The Japanese garrison peaked at 27,856 naval personnel under Hara’s command and 16,737 army personnel under the tactical command of Major General Kanenobu Ishuin, commander of the 51st Independent Mixed Brigade, on the atoll’s various islands, on which the Japanese Civil Engineering Department and Naval Construction Department had built roads, trenches, bunkers and caves. The whole defensive complex included five airfields, seaplane bases, a torpedo boat station, submarine repair facilities, a communications centre and a radar station. The US forces had no strategically compelling reason for a direct assault on the Japanese in and around Truk atoll, which were therefore to be neutralised by air and sea forces in the manner which was being accomplished very effectively against Rabaul. 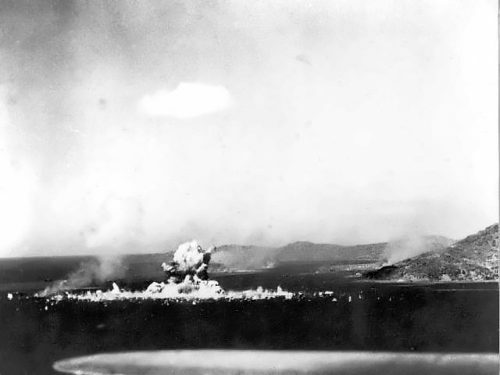 The 5th Fleet attacked Truk atoll from the air in ‘Hailstone’ on 17/18 February 1944: eight aircraft carriers, six battleships, 10 cruisers and 28 destroyers of Task Force 58 approached Truk from the north-east and sailed around the atoll and back to the north-east while launching 30 air strikes of significantly more power than the two Japanese ‘Ai’ strikes on Pearl Harbor. The Combined Fleet, which TF58 had hoped to catch in the lagoon, had taken heed of indicators of the coming attack and had withdrawn westward to the Palau islands group on 10 February, however. The US strikes did sink two cruisers, two destroyers, one aircraft ferry, two submarine tenders, one auxiliary merchant cruiser, six tankers and 17 merchant ships, destroyed some 100 aircraft on the ground and in the air, and inflicted serious damage to shore installations. 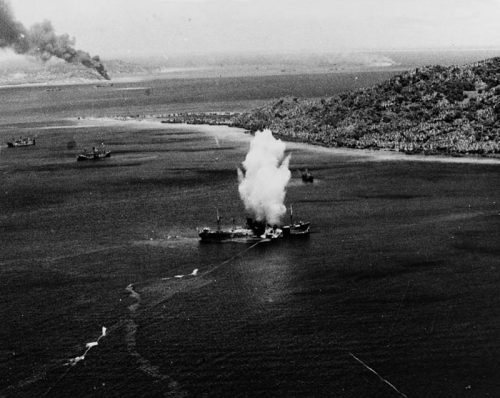 The Americans did not make their final decision whether or not to assault Truk until 12 March 1944, when they decided that the base would be bypassed. Another series of carrier strikes was carried out on 29/30 April to destroy the remaining Japanese air power, which by then had been rebuilt to 104 aircraft. Of these, about 93 were destroyed in the air or on the ground, at a cost to the Americans of 35 aircraft: more than half of the downed US airmen were rescued by submarines or seaplanes, and included one crew within Truk lagoon itself. Occasional raids thereafter, flown mostly from Eniwetok and the Admiralty islands group, prevented the base from becoming once more any form of serious threat. Consolidated B-24 Liberator and Boeing B-29 Superfortress heavy bombers continued to raid Truk on a frequent basis until the end of the war, and the atoll was seen as providing a good training target for newly arrived bomber units. 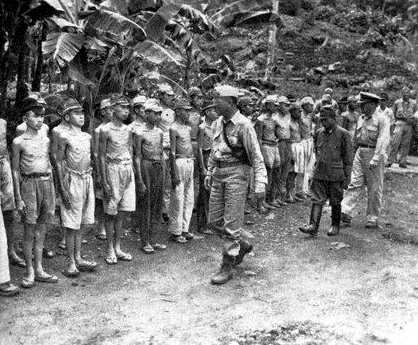 On 2 September 1945, Hara and Mugikura surrendered the Truk garrison and the outlying garrisons, a total of 130,000 military personnel and civilians, to Vice Admiral George D. Murray aboard the heavy cruiser Portland in the largest single surrender of the Pacific Ocean Areas. Occupation forces of the US Marine Corps did not arrive until 24 November, and were then based on Moen island. Previous post: ‘Fathead’ – A Far-Eastern ‘Mincemeat’?